A flange can also be a plate or ring to form a rim at the end of a pipe when fastened to the pipe (for example, a closet flange). A blind flange is a plate for covering or closing the end of a pipe. A flange joint is a connection of pipes, where the connecting pieces have flanges by which the parts are bolted together. Common flanges used in plumbing are the Surrey flange or Danzey flange, York flange, Sussex flange and Essex flange. Surrey and York flanges fit to the top of the hot water tank allowing all the water to be taken without disturbance to the tank. They are often used to ensure an even flow of water to showers. An Essex flange requires a hole to be drilled in the side of the tank. There is also a Warix flange which is the same as a York flange but the shower output is on the top of the flange and the vent on the side. The York and Warix flange have female adapters so that they fit onto a male tank, whereas the Surrey flange connects to a female tank. A closet flange provides the mount for a toilet. In most cases these are interchangeable as most local standards have been aligned to ISO standards, however, some local standards still differ (e.g. an ASME flange will not mate against an ISO flange). Further, many of the flanges in each standard are divided into "pressure classes", allowing flanges to be capable of taking different pressure ratings. Again these are not generally interchangeable (e.g. an ASME 150 will not mate with an ASME 300). These pressure classes also have differing pressure and temperature ratings for different materials. Unique pressure classes for piping can also be developed for a process plant or power generating station; these may be specific to the corporation, engineering procurement and construction (EPC) contractor, or the process plant owner. The ASME pressure classes for Flat-Face flanges are Class 125 and Class 250. The classes for Ring-Joint, Tongue & Groove, and Raised-Face flanges are Class 150, Class 300, (Class 400 - unusual), Class 600, Class 900, Class 1500, and Class 2500. The flange faces are also made to standardized dimensions and are typically "flat face", "raised face", "tongue and groove", or "ring joint" styles, although other obscure styles are possible. Flange designs are available as "weld neck", "slip-on", "lap joint", "socket weld", "threaded", and also "blind". Pipe flanges that are made to standards called out by ASME B16.5 or ASME B16.47, and MSS SP-44. They are typically made from forged materials and have machined surfaces. ASME B16.5 refers to nominal pipe sizes (NPS) from ½" to 24". B16.47 covers NPSs from 26" to 60". Each specification further delineates flanges into pressure classes: 150, 300, 400, 600, 900, 1500 and 2500 for B16.5, and B16.47 delineates its flanges into pressure classes 75, 150, 300, 400, 600, 900. However these classes do not correspond to maximum pressures in psi. Instead, the maximum pressure depends on the material of the flange and the temperature. For example, the maximum pressure for a Class 150 flange is 285 psi, and for a Class 300 Flange it is 740 psi (both are for ASTM A105 Carbon Steel and temperatures below 100F). Materials for flanges are usually under ASME designation: SA-105 (Specification for Carbon Steel Forgings for Piping Applications), SA-266 (Specification for Carbon Steel Forgings for Pressure Vessel Components), or SA-182 (Specification for Forged or Rolled Alloy-Steel Pipe Flanges, Forged Fittings, and Valves and Parts for High-Temperature Service). In addition, there are many "industry standard" flanges that in some circumstance may be used on ASME work. The product range includes SORF, SOFF, BLRF, BLFF, WNRF (XS, XXS, STD & Schedule 20, 40, 80), WNFF (XS, XXS, STD & Schedule 20, 40, 80), SWRF (XS & STD), SWFF (XS & STD), Threaded RF, Threaded FF & LJ, with sizes from 1/2" to 16". The bolting material used for flange connection is stud bolts mated with two nut (washer when required). In Petrochemical industries, ASTM A193 B7 STUD & ASTM A193 B16 Stud Bolts are used as these have high tensile strength. Most countries in Europe mainly install flanges according to standard DIN EN 1092-1 (forged Stainless or Steel Flanges). Similar to the ASME flange standard, the EN 1092-1 standard has the basic flange forms, such as weld neck flange, blind flange, lappedthe flange, threaded Flange (Thread ISO7-1 instead of NPT), weld on collar, pressed collars, and adapter flange such as flange coupling GD pressfittings. The different forms of flanges within the EN 1092-1 (European Norm Euronorm) is indicated within the flange name through the type. Flanges in the rest of the world are manufactured according to the ISO standards for materials, pressure ratings, etc. to which local standards including DIN, BS.... have been aligned. As the Compact flange size increase it becomes relatively increasingly heavy and complex resulting in high procurement, installation and maintenance costs. Large flange diameters in particular are difficult to work with, and inevitably require more space and have a more challenging handling and installation procedure, particularly on remote installations such as oil rigs. The principal design of the flange the ace includes two independent seals. The first seal is created by application of seal seating stress at the flange heel, but it is not straight forward to ensure the function of this seal. Theoretically, the heel contact will be maintained for pressure values up to 1,8 times the flange rating at room temperature. Theoretically, the flange also remains in contact along its outer circumference at the flange faces for all allowable load levels that it is designed for. The main seal is the IX seal ring. The seal ring force is provided by the elastic stored energy in the stressed seal ring. Any heel leakage will give internal pressure acting on the seal ring inside intensifying the sealing action. This however requires the IX ring to be retained in the theoretical location in the ring groove which is difficult to ensure and verify during installation. The design aims at preventing exposure to oxygen and other corrosive agents. Thus, this prevents corrosion of the flange faces, the stressed length of the bolts and the seal ring. This however depends on the outer dust rim to remain in satisfactory contact and that the inside fluid is not corrosive in case of leaking into the bolt circle void. The initial cost of the theoretical higher performance compact flange is inevitably higher than a regular flange due to the closer tolerances and significantly more sophisticated design and installation requirements. By way of example, compact flanges are often used across the following applications: subsea oil and gas or riser, cold work and cryogenics, gas injection, high temperature, and nuclear applications. Trains stay on their tracks primarily due to the conical geometry of their wheels. They also have a flange on one side to keep the wheels, and hence the train, running on the rails, when the limits of the geometry based alignment are reached, e.g. due to some emergency or defect. Form factor of PDR and CBR flanges. In microwave telecommunications, a flange is a type of cable joint which allows different types of waveguide to connect. Several different microwave RF flange types exist, such as CAR, CBR, OPC, PAR, PBJ, PBR, PDR, UAR, UBR, UDR, icp and UPX. Ski boots use flanges at the toe or heel to connect to the binding of the ski. The size and shape for flanges on alpine skiing boots is standardized in ISO 5355. Traditional telemark and cross country boots use the 75 mm Nordic Norm, but the toe flange is informally known as the "duckbill". New cross country bindings eliminate the flange entirely and use a steel bar embedded within the sole instead. Nayyar, Mohinder (1999). Piping Handbook, Seventh Edition. New York: McGraw-Hill. ISBN 0-07-047106-1. ASTM A992 steel is a structural steel alloy often used in the USA for steel wide-flange and I beams. Like other carbon steels, the density of ASTM A992 steel is approximately 7850 kg/m3 (0.2836 lb/in3). ASTM A992 steel has the following minimum mechanical properties, according to ASTM specification A992/A992M. Tensile yield strength, 345 MPa (50 ksi); tensile ultimate strength, 450 MPa (65 ksi); strain to rupture (sometimes called elongation) in a 200-mm-long test specimen, 18%; strain to rupture in a 50-mm-long test specimen, 21%. ASTM A992 is currently the most available steel type for structural wide-flange beams. The industry's technical institute describes the standard thus: "ASTM A992 (Fy = 50 ksi, Fu = 65 ksi) is the preferred material specification for wide-flange shapes, having replaced ASTM A36 and A572 grade 50. There are a couple of noteworthy enhancements with ASTM A992. Material ductility is well defined since a maximum yield-to-tensile strength ratio of 0.85 is specified. Additionally, weldability is improved since a maximum carbon equivalent value of 0.45 (0.47 for Group 4 and 5 shapes) is required. ASTM A992 is written to cover all hot-rolled shapes." The beak, bill, and/or rostrum is an external anatomical structure of birds that is used for eating and for preening, manipulating objects, killing prey, fighting, probing for food, courtship and feeding young. The terms beak and rostrum are also used to refer to a similar mouth part in some ornithischians, pterosaurs, turtles, cetaceans, dicynodonts, anuran tadpoles, monotremes (i.e.echidnas and platypuses, which have a beak like structure),sirens, pufferfish, billfishes and cephalopods. Deep drawing is a sheet metal forming process in which a sheet metal blank is radially drawn into a forming die by the mechanical action of a punch. It is thus a shape transformation process with material retention. The process is considered "deep" drawing when the depth of the drawn part exceeds its diameter. This is achieved by redrawing the part through a series of dies. The flange region (sheet metal in the die shoulder area) experiences a radial drawing stress and a tangential compressive stress due to the material retention property. These compressive stresses (hoop stresses) result in flange wrinkles (wrinkles of the first order). Wrinkles can be prevented by using a blank holder, the function of which is to facilitate controlled material flow into the die radius. A derailment occurs when a vehicle such as a train runs off its rails. This does not necessarily mean that it leaves its track. Although many derailments are minor, all result in temporary disruption of the proper operation of the railway system, and they are potentially seriously hazardous to human health and safety. Usually, the derailment of a train can be caused by a collision with another object, an operational error, the mechanical failure of tracks, such as broken rails, or the mechanical failure of the wheels. In emergency situations, deliberate derailment with derails or catch points is sometimes used to prevent a more serious accident. For an interchangeable lens camera, the flange focal distance (FFD) (also known as the flange-to-film distance, flange focal depth, flange back distance (FBD), flange focal length (FFL), or register, depending on the usage and source) of a lens mount system is the distance from the mounting flange (the metal ring on the camera and the rear of the lens) to the film plane. This value is different for different camera systems. The range of this distance, which will render an image clearly in focus within all focal lengths, is usually measured in hundredths of millimeters and is known as the depth of focus (not to be confused with the similarly named depth of field). If the difference is small, other factors, such as the diameters of the mounting flanges of the two systems, come into play as well. Lens adapters are generally easier to make when the camera body has a large lens mount. A flange nut is a nut that has a wide flange at one end that acts as an integrated washer. This serves to distribute the pressure of the nut over the part being secured, reducing the chance of damage to the part and making it less likely to loosen as a result of an uneven fastening surface. These nuts are mostly hexagonal in shape and are made up of hardened steel and often coated with zinc. In many cases, the flange is fixed, and turns with the nut. The flange may be serrated to provide a locking action. The serrations are angled such that they keep the nut from rotating in the direction that would loosen the nut. Because of the serrations they cannot be used with a washer or on surfaces that must not be scratched. The serrations help in preventing the vibration of the nut from moving the fastener, thus maintaining the holding power of nut. Flange nuts are sometimes provided with a swivel flange which helps in creating a more stable structure without affecting finished product like a serrated flange nut. Swivel flange nuts are mostly used in joining wood and plastic. Sometimes both faces of the nut are serrated, permitting either side to lock. A Self-aligning nut has a flange with a convex spherical shape, which mates with a concave dished washer, to allow the nut to tighten on a surface which is not perpendicular to the nut. Part of the output signal is usually fed back to the input (a "re-circulating delay line"), producing a resonance effect which further enhances the intensity of the peaks and troughs. The phase of the fed-back signal is sometimes inverted, producing another variation on the flanger sound. Gaskets allow for "less-than-perfect" mating surfaces on machine parts where they can fill irregularities. Gaskets are commonly produced by cutting from sheet materials. Gaskets for specific applications, such as high pressure steam systems, may contain asbestos. However, due to health hazards associated with asbestos exposure, non-asbestos gasket materials are used when practical.It is usually desirable that the gasket be made from a material that is to some degree yielding such that it is able to deform and tightly fill the space it is designed for, including any slight irregularities. A few gaskets require an application of sealant directly to the gasket surface to function properly. Some (piping) gaskets are made entirely of metal and rely on a seating surface to accomplish the seal; the metal's own spring characteristics are utilized (up to but not passing σy, the material's yield strength). This is typical of some "ring joints" (RTJ) or some other metal gasket systems. These joints are known as R-con and E-con compressive type joints. An I-beam, also known as H-beam (for universal column, UC), w-beam (for "wide flange"), universal beam (UB), rolled steel joist (RSJ), or double-T (especially in Polish, Bulgarian, Spanish, Italian and German), is a beam with an I or H-shaped cross-section. The horizontal elements of the "I" are known as flanges, while the vertical element is termed the "web". I-beams are usually made of structural steel and are used in construction and civil engineering. ISO 2852 Stainless steel clamp pipe couplings for the food industry is an international standard that defines a non-permanent sanitary food-grade piping interconnect method, commonly used in the food processing industry and with dairy farm equipment. a lip flange on the ends of pipes with a grooved indentation on the flange. a polymer sealing gasket placed between sections of pipe, squeezed between the flanges. This ring has a raised groove on both sides mating with the indentations of the two pipes on either side. an enclosing clamp with C-shape clamping sections that cover the outer circumference of the flanges, applying pressure to squeeze the two pipe sections together onto the sealing ring. The clamp also provides structural strength and rigidity to the pipe sections.The combined lip flange and gasket do not impede the flow of fluids through the piping. The clamping system may be permanent, using a hose clamp style screw and band, or it may be easily removable using a fold-over hinged clamp assembly. a flanged or tapered or threaded bar that grips a workpiece to be machined in a lathe. A flanged mandrel is a parallel bar of a specific diameter with an integral flange towards one end, and threaded at the opposite end. Work is gripped between the flange and a nut on the thread. A tapered mandrel (often called a plain mandrel) has a taper of approximately 0.005 inches per foot and is designed to hold work by being driven into an accurate hole on the work, gripping the work by friction. A threaded mandrel may have a male or female thread, and work which has an identical thread is screwed onto the mandrel. On a lathe, mandrels are commonly mounted between centres and driven by a lathe dog (typically the flanged or tapered mandrels), but may also be gripped in a chuck (typically the threaded mandrels, where the outer face of work is to be machined. Threaded mandrels may also be mounted between centres. In addition to lathes, arbors are used to hold buffing wheels, circular saws, and sanding discs. Typically, these mandrels consist of a cylinder that is threaded on one end. There are many different types of mandrels for specialized applications. Examples include live chuck mandrels, live bull ring mandrels, and dead bull ring mandrels. a shaped bar of metal which is placed inside a workpiece to be formed, e.g. arbors used to bend the exhaust pipes for automobiles and in the production of molten glass, metal rings, threaded rods, and furniture legs. Matt Monro (born Terence Edward Parsons, 1 December 1930 – 7 February 1985) was an English crooner who became one of the most popular entertainers on the international music scene during the 1960s and 1970s. Known as The Man with the Golden Voice, he filled cabarets, nightclubs, music halls, and stadiums across the world in his 30-year career. AllMusic has described Monro as "one of the most underrated pop vocalists of the '60s", who "possessed the easiest, most perfect baritone in the business". His recordings include the UK Top 10 hits: "Portrait of My Love", "My Kind of Girl", "Softly As I Leave You", "Walk Away" and "Yesterday" (Originally by The Beatles). He also recorded several film themes such as "From Russia with Love" for the James Bond film of the same name, "Born Free" for the film of the same name and "On Days Like These" for The Italian Job. The Micro Four Thirds system (MFT or M4/3) is a standard released by Olympus and Panasonic in 2008, for the design and development of mirrorless interchangeable lens digital cameras, camcorders and lenses. Camera bodies are available from Blackmagic, DJI, JVC, Kodak, Olympus, Panasonic, Sharp Corporation, and Xiaomi. MFT lenses are produced by Cosina Voigtländer, DJI, Kowa, Kodak, Mitakon, Olympus, Panasonic, Samyang, Sharp Corporation, Sigma, SLR Magic, Tamron, Tokina, Veydra, and Xiaomi, amongst others. MFT shares the original image sensor size and specification with the Four Thirds system, designed for DSLRs. Unlike Four Thirds, the MFT system design specification does not provide space for a mirror box and a pentaprism, which facilitates smaller body and lens designs via the shorter flange focal distance of 19.25mm. The short flange distance, when combined with an adapter of proper depth, allows MFT bodies to use almost any lens ever made for a camera with a flange distance larger than 19.25mm. Still-camera lenses produced by Canon, Leica, Minolta, Nikon, Pentax and Zeiss have all been successfully adapted for MFT use - as well as lenses produced for cinema, e.g., PL mount or C mount. an airtight seal, known as a two-piece system. The selection of systems varies greatly between individuals and is often based on personal preference and lifestyle. Ostomy pouching systems collect waste that is output from a stoma. The pouching system allows the stoma to drain into a sealed collection pouch, while protecting the surrounding skin from contamination.Ostomy pouching systems are air- and water-tight and allow the wearer to lead an active lifestyle that can include all forms of sports and recreation.Ostomy pouching systems are also sometimes referred to as an appliance, where the term appliance refers to a prosthesis, as a mechanical replacement for a biological function. The term originally referred to portions of a log that had been split lengthwise into four or six sections. The radial members of a wagon wheel were made by carving a spoke (from a log) into their finished shape. A spokeshave is a tool originally developed for this purpose. Eventually, the term spoke was more commonly applied to the finished product of the wheelwright's work, than to the materials he used. A T-beam (or tee beam), used in construction, is a load-bearing structure of reinforced concrete, wood or metal, with a t-shaped cross section. The top of the t-shaped cross section serves as a flange or compression member in resisting compressive stresses. The web (vertical section) of the beam below the compression flange serves to resist shear stress and to provide greater separation for the coupled forces of bending.The T-beam has a big disadvantage compared to an I-beam because it has no bottom flange with which to deal with tensile forces. One way to make a T-beam more efficient structurally is to use an inverted T-beam with a floor slab or bridge deck joining the tops of the beams. Done properly, the slab acts as the compression flange. In railway signalling, a treadle is a mechanical or electrical device that detects that a train axle has passed a particular location. They are used where a track circuit requires reinforcing with additional information about a train's location, such as around an automatic level crossing, or in an annunciator circuit, that sounds a warning a train has passed an exact point. They also serve as a critical backup in the case of track circuit failure. 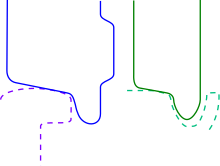 The important difference between a treadle and a track circuit is that while a track circuit detects a train over a distance as long as several kilometres, a treadle provides detection at a single fixed location.